Home ⁄ Frequently Asked Questions ⁄ What makes Clearfil Universal Bond plus CLEARFIL MAJESTY ES Flow the ideal restorative duo? CLEARFIL Universal Bond offers an “out of this world” adhesive in one bottle for all your etching and restorative needs. CLEARFIL MAJESTY ES Flow is a universal flowable composite for all direct applications. Together, these products offer Universal Use with Optimum Performance!! 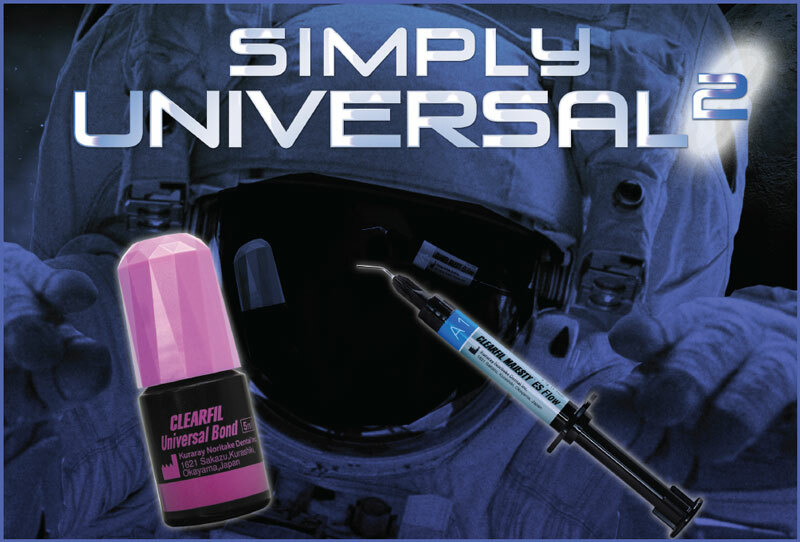 CLEARFIL Universal Bond can be used for all direct restorations using light-cured composite resin. This single-component bonding agent is compatible with all etching techniques (Total-etch; Self-etch and Selective-etch). Based on Kuraray’s original MDP technology, CLEARFIL Universal Bond offers the power of one-bottle bonding. CLEARFIL MAJESTY ES Flow is a light-cure, universal, flowable composite which is suitable for all cavity classes; and as a liner/base material. Due to its special submicron fillers, a high level gloss can be achieved by simply wiping the cured restoration with an ethanol gauze. The special filler technology in CLEARFIL MAJESTY ES Flow combines high polishability, light diffusion and high mechanical properties. A truly universal flowable composite to satisfy all your needs.